This special issue of the FEZANA JOURNAL is in recognition of the exhibition “The Cyrus Cylinder and Ancient Persia: A New Beginning – The Legacy of Cyrus the Great: Iran and Beyond”. The FEZANA JOURNAL, the official publication of the Federation of Zoroastrian Associations of North America (FEZANA) has produced this visual delight of memorable images and scholarly articles of our Zoroastrian heritage which we are sharing with you. 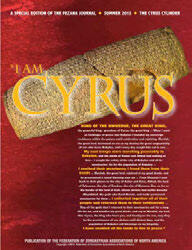 The 2600 year old Cyrus Cylinder is presently touring North America thanks to the combined efforts of the British Museum, the Iran Heritage Foundation, and Iran Heritage Foundation (America). This little known cylinder, which had resided since 1879 in the British Museum, was the proclamation of the Achaemenian King Cyrus the Great at the time of his conquest of Babylon. The Achaemenians were followers of the Zoroastrian religion and it is a matter of pride and joy to FEZANA that this cylinder has brought recognition to the small but vibrant Zoroastrian community of North America. During the sojourn of the cylinder at the various museums, Washington D.C, Houston, New York, to date, FEZANA organized special commemorative public events which were well attended. These will now be followed by the exhibits in San Francisco, and Los Angeles. Print copies of this special color edition will be mailed to all our subscribers and for the first time we are offering an electronic copy to reach a wider audience. Download a copy of the FEZANA Journal issue.